I was thrilled to learn FableCroft Publishing had picked up Book Three in Jo Anderton’s Veiled World Trilogy – Guardian. I’d already read and loved books one and two– Debris and Suited–and was really looking forward to finding out how Anderton would manage to tie up such a complex storyline. But before I begin, a little disclaimer–I’m intentionally vague with this review. Being the last in the series, it’s all too easy to drop spoiler-bombs for the first two books, and these stories are far too good for that. The Veiled World trilogy is big. I don’t necessarily mean in page numbers (though they’re all decent sized books, just not door-stops), I mean in the sheer scope of story. I’ve mentioned before that Anderton is a master world-builder, and she well and truly proves it here in the final instalment when protagonist Tanyana begins to slide across the veils–or through the doors–to even more worlds: worlds that are still connected to the one she shares in Movac-under-Keeper with Kichlan and her Debris collection team–Tanyana’s home. As with Suited, Jo Anderton kicks this novel off with a deft recap of the last book. Rather than a “Previously…in The Veiled Worlds” type of summary, she manages to give the reader swift and unique catch-up by means of a report from a character whose thoughts we don’t usually get much of. Not only is this a clever tool to jog the reader’s memory, but it places the story smack into what we once believed was nothing more than the mythology of the Veiled Worlds. In my review of Suited, I wrote about the fantastic character development from book one to two. So many novels with complex world building drop the ball when it comes to giving the reader characters they can really care about. Anderton has again pushed further than I expected. I felt comfortable with both Tanyana and her supporting cast–maybe too comfortable–and loved the way I was propelled forward alongside the characters as they were forced to keep moving, keep fighting, with little more than hope to keep them going. The Veiled World trilogy is written at a frantic pace, and the character development keeps up with the plot. These are people who can’t be unchanged for what they have seen and endured, both mentally and physically (oh, the physical!) Even after a long break between reading books two and three, I slipped straight back into an emotional investment in Tanyana and…and I’m so not going to say who else (I did say no spoilers). Tanyana herself undergoes the biggest changes, and it is her strength and growth of character that impressed me most. Over the course of three books, she has grown from a talented and privileged member of society (though maybe a little too privileged? ), to scraping the bottom of that same culture, to becoming the strong and deserving champion. 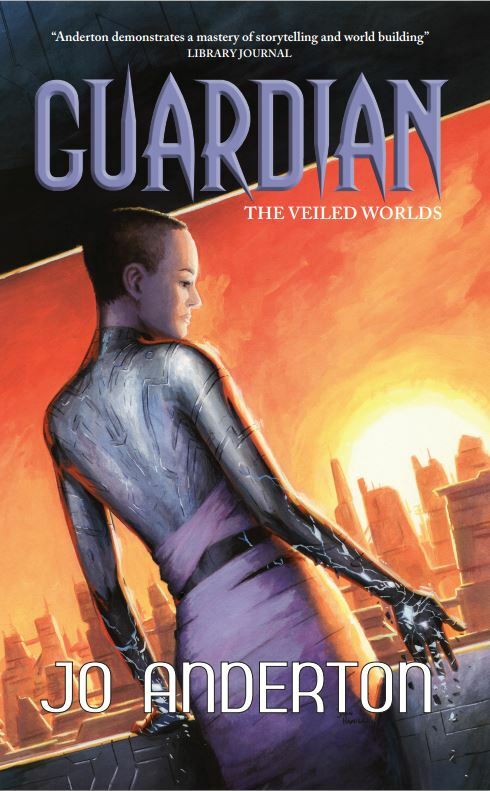 I felt Guardian was more science fiction than fantasy, and definitely more cyber than anything else. This is a little change from the first two books, though the mythological elements still hold this story together at the end of the day. Jo Anderton slips the reader information like jellybeans (or Lindt chocolate–whichever is your poison), only the smallest morsel at a time, which makes it hard for the type of reader who likes to problem solve ahead of time. I found the author to have great control over what she wanted us to know and when we could know it. My single frustration with Guardian was with the evil Puppet Men. As antagonists, I found them to be a little too nebulous–though that could well have been Anderton’s intention, as I’m sure Tanyana felt the same. There’s tragedy, relief, and still plenty of ‘a-ha!’ moments. I’ll give fair warning…there will be tears, so have the tissues handy. After three books, it’s impossible not to lose it a little when a story like this comes to an end. For this reason, even though Guardian could possibly be read as a stand-alone novel, to get the most from it, I recommend reading Debris and Suited first if you haven’t already done so. Okay, we all know the deal – you need a spectacular dessert, and no time to bake from scratch. If you’re anything like me and have a reasonably well-stocked pantry, you might even manage this one without a trip to the supermarket (I did!). 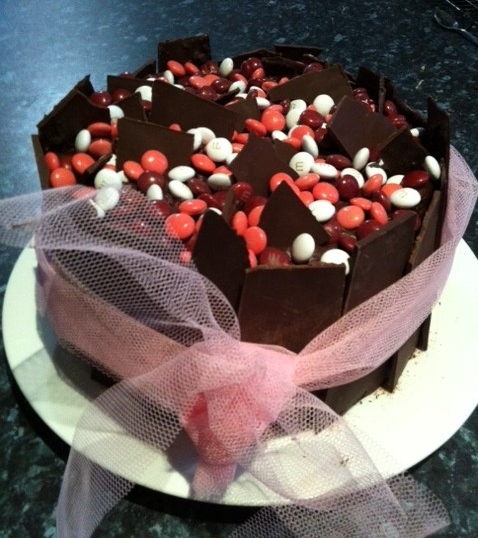 I baked this one for my sister-in-law Kerrie, for her recent birthday. Prepare cake mixes according to the directions on the packet. I baked them in two 20cm round pans. Allow to cool, and then slice each cake horizontally in half – use a bread knife to do this – it makes life easy. Also trim the top of each cake so they are nice and flat. While your cakes are baking, defrost your raspberries, then mix and mash them into the ready-made vanilla frosting. Pop the raspberry mixture into the fridge to help it firm up a little while your cakes are cooling. Melt the chocolate buds using your preferred method – I use the microwave for small amounts like this – in two batches. On a long piece of baking paper laid flat on the bench, spread the chocolate as smoothly as you can. Allow chocolate to set for around ten minutes at room temperature, but not until it’s completely hard. With a sharp knife, score vertical lines right through the chocolate, to leave you with pieces about 5cm wide. I did mine on a slight angle for added effect. Allow the chocolate to set totally, then put aside for decorating. 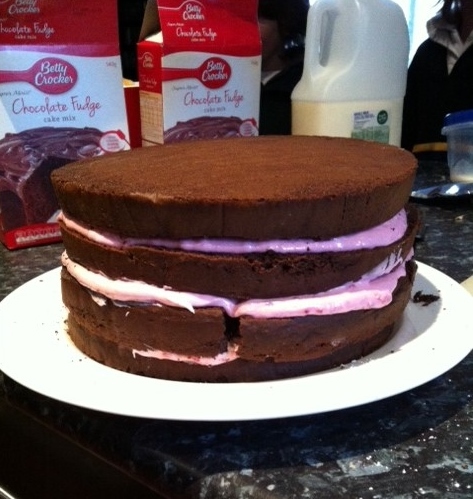 Spread approximately one third of the chilled raspberry and frosting mix over one of your cake halves. Layer another half cake and repeat with the frosting – and repeat again until you add the very top cake half. (Yes, I know that would technically make them cake quarters, but hey…) Spread the chocolate frosting over this top half, keeping some frosting in reserve. Use this frosting to ‘glue’ the chocolate pieces around the outside of your cake. You can use perfectly measured pieces that all match, but I liked the idea of it being a little more rustic. 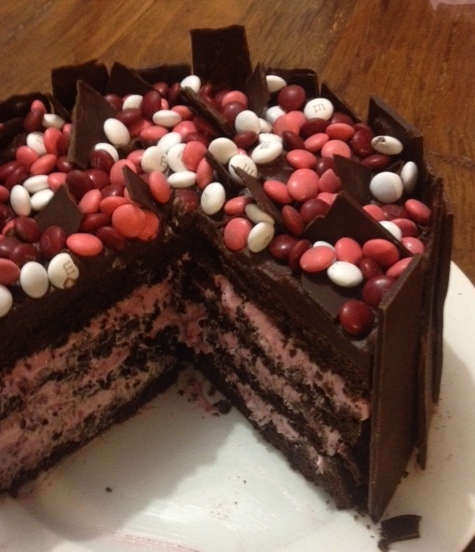 The chocolate slabs should stay put with the frosting, but I also added a tulle bow because – pretty! Then, cover the top of your cake with the M&M’s. 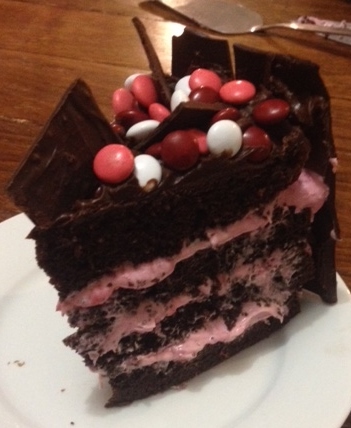 I added a few left-over pieces of chocolate too, because I knew the recipient of this particular cake happens to be a chocoholic! There are a zillion variations you could use for a simple cake like this one. Instead of sticking with pinks, what about the bright multicolours of a traditional M&M pack? Blueberries instead of raspberries? Cookies and cream? Mint chocolate? Caramel, white chocolate? Hmm, white chocolate and caramel…might try that one soon actually. Anyone have a birthday coming up?